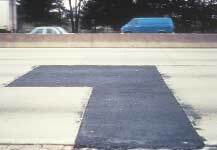 This section covers jointed (plain and reinforced) portland cement concrete-surfaced pavements (JCP), including jointed concrete overlays on PCC pavements. Table 2 summarizes the various types of distress and unit of measurement. Some distresses also have defined severity levels. Figure 47 illustrates the proper measurement of crack width and width of spalling for cracks and joints. 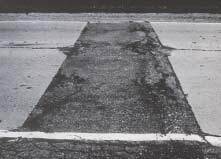 A portion of the slab separated by a crack, which intersects the adjacent transverse and longitudinal joints, describing approximately a 45-degree angle with the direction of traffic. The length of the sides is from 0.3 m to one-half the width of the slab on each side of the corner. Crack is not spalled for more than 10 percent of the length of the crack; there is no measurable faulting; and the corner piece is not broken into two or more pieces and has no loss of material and no patching. Crack is spalled at low severity for more than 10 percent of its total length; or faulting of crack or joint is < 13 mm; and the corner piece is not broken into two or more pieces. Crack is spalled at moderate to high severity for more than 10 percent of its total length; or faulting of the crack or joint is ≥ 13 mm; or the corner piece is SYMBOL broken into two or more pieces or contains patch material. Record number of corner breaks at each severity level. 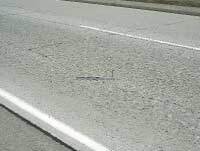 Corner breaks that have been repaired by completely removing all broken pieces and replacing them with patching material (rigid or flexible) should be rated as a patch. If the boundaries of the corner break are visible, then also rate as a high severity corner break. Note: This does not affect the way patches are rated. All patches meeting the size criteria are rated. Closely spaced crescent-shaped hairline cracking pattern. Occurs adjacent to joints, cracks, or free edges; initiating in slab corners. Dark coloring of the cracking pattern and surrounding area. Record number of slabs with "D" cracking and square meters of area affected at each severity level. The slab and affected area severity rating is based on the highest severity level present for at least 10 percent of the area affected. "D" cracks are tight, with no loose or missing pieces, and no patching is in the affected area. "D" cracks are well-defined, and some small pieces are loose or have been displaced. 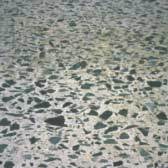 "D" cracking has a well-developed pattern, with a significant amount of loose or missing material. Displaced pieces, up to 0.1 m2, may have been patched. Cracks that are predominantly parallel to the pavement centerline. Crack widths < 3 mm, no spalling and no measurable faulting; or well-sealed and with a width that cannot be determined. Crack widths ³ 3 mm and < 13 mm; or with spalling < 75 mm; or faulting up to 13 mm. Crack widths ³ 13 mm; or with spalling ³ 75 mm; or faulting ³ 13 mm. Record length in meters of longitudinal cracking at each severity level. Also record length in meters of longitudinal cracking with sealant in good condition at each severity level. Cracks that are predominantly perpendicular to the pavement centerline. Crack widths < 3 mm, no spalling and no measurable faulting; or well-sealed and the width cannot be determined. Crack widths ³ 3 mm and < 6 mm; or with spalling < 75 mm; or faulting up to 6 mm. Crack widths ³ 6 mm; or with spalling ³ 75 mm; or faulting ³ 6 mm. Also record the length, in meters, of transverse cracking at each severity level with sealant in good condition. The length recorded, in meters, is the total length of the well-sealed crack and is assigned to the severity level of the crack. Record only when the sealant is in good condition for at least 90 percent of the length of the crack. Extrusion, hardening, adhesive failure (bonding), cohesive failure (splitting), or complete loss of sealant. Intrusion of foreign material in the joint. Weed growth in the joint. Joint seal damage as described above exists over less than 10 percent of the joint. Joint seal damage as described above exists over 10-50 percent of the joint. Joint seal damage as described above exists over more than 50 percent of the joint. Indicate whether the transverse joints have been sealed (yes or no). If yes, record number of sealed transverse joints at each severity level. Any joint seal with no apparent damage is considered to be low severity. Record number of longitudinal joints that are sealed (0, 1, 2). Record total length of sealed longitudinal joints with joint seal damage as described above. Individual occurrences are recorded only when at least 1 m in length. Cracking, breaking, chipping, or fraying of slab edges within 0.3 m from the face of the longitudinal joint. Spalls < 75 mm wide, measured to the face of the joint, with loss of material, or spalls with no loss of material and no patching. Spalls 75 mm to 150 mm wide, measured to the face of the joint, with loss of material. Spalls > 150 mm wide, measured to the face of the joint, with loss of material or is broken into two or more pieces or contains patch material. Record length in meters of longitudinal joint affected at each severity level. Only record spalls that have a length of 0.1 m or more. Spalls that have been repaired by completely removing all broken pieces and replacing them with patching material (rigid or flexible) should be rated as a patch. If the boundaries of the spall are visible, then also rate as a high severity spall. Note: All patches meeting size criteria are rated as patches. Cracking, breaking, chipping, or fraying of slab edges within 0.3 m from the face of the transverse joint. Spalls > 150 mm wide, measured to the face of the joint, with loss of material, or broken into two or more pieces, or contains patch material. Record number of affected transverse joints at each severity level. A joint is affected only if the total length of spalling is 10 percent or more of the length of the joint. Rate the entire transverse joint at the highest severity level present for at least 10 percent of the total length of the spalling. Record length in meters of the spalled portion of the joint at the assigned severity level for the joint. Spalls that have been repaired by completely removing all broken pieces and replacing them with patching material (rigid or flexible) should be rated as a patch. If the boundaries of the spall are visible, then also rate as a high severity spall. Note: All patches meeting size criteria are rated as patches. A series of cracks that extend only into the upper surface of the slab. 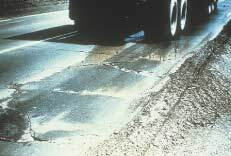 Larger cracks frequently are oriented in the longitudinal direction of the pavement and are interconnected by finer transverse or random cracks. Record the number of occurrences and the square meters of affected area. Scaling is the deterioration of the upper concrete slab surface, normally 3 mm to 13 mm, and may occur anywhere over the pavement. Surface mortar and texturing worn away to expose coarse aggregate. Record square meters of affected surface area. NOTE: Diamond grinding also removes the surface mortar and texturing. However, this condition should not be recorded as polished aggregate, but instead, be noted by a comment. Small pieces of pavement broken loose from the surface, normally ranging in diameter from 25 mm to 100 mm, and depth from 13 mm to 50 mm. Not applicable. However, severity levels can be defined in relation to the intensity of popouts as measured below. Localized upward movement of the pavement surface at transverse joints or cracks, often accompanied by shattering of the concrete in that area. Not applicable. However, severity levels can be defined by the relative effect of a blowup on ride quality and safety. Record the number of blowups. Difference in elevation across a joint or crack. Not applicable. Severity levels could be defined by categorizing the measurements taken. A complete record of the measurements taken is much more desirable, however, because it is more accurate and repeatable than are severity levels. Record in millimeters, to the nearest millimeter: 0.3 m and 0.75 m from the outside slab edge (approximately the outer wheel path). For a widened lane, the wheel path location will be 0.75 m from the outside lane edge stripe. At each location, three measurements are made, but only the approximate average of the readings is recorded. If the "approach" slab is higher than the "departure" slab, record faulting as positive (+); if the approach slab is lower, record faulting as negative (-). Faulting on PCC pavements is to be measured using a FHWA-modified Georgia Faultmeter. A representative reading from three distinct measurements at each location is to be used and recorded on sheet 6. When anomalies such as patching, spalling, and corner breaks are encountered, the faultmeter should be offset to avoid the anomaly. The maximum offset is 0.3 m. A null value ("N") should be recorded and entered into the database when the surveyor is unable to take a measurement due to an anomaly. Surveyors must ensure that they have a working faultmeter with fully charged batteries prior to beginning a survey on a jointed PCC test section. Complete faulting measurements and survey sheet 6 at the beginning of the distress survey to ensure that this data is collected. Point distance measurements entered on sheet 6 for joints and transverse cracks should be consistent between surveys of the same test section to an accuracy of less than 0.5 m. Evaluate newly observed distresses and point distance differences for previously identified distresses of 0.5 m and greater with a metric tape measure. Note: The precise start point of surveys must be clearly identified in the field. Difference in elevation between the edge of slab and outside shoulder; typically occurs when the outside shoulder settles. Not applicable. Severity levels can be defined by categorizing the measurements taken. A complete record of the measurements taken is much more desirable, however, because it is more accurate and repeatable than are severity levels. Measure at the longitudinal construction joint between the lane edge and the shoulder. Record to the nearest millimeter at 15.25-m intervals along the lane-to-shoulder joint. If the traveled surface is lower than the shoulder, record as a negative (-) value. Widening of the joint between the edge of the slab and the shoulder. Not applicable. Severity levels can be defined by categorizing the measurements taken. A complete record of the measurements taken is much more desirable, however, because it is more accurate and repeatable than severity levels. Record to the nearest millimeter at intervals of 15.25 m along the lane-to-shoulder joint. Indicate whether the joint is well-sealed (yes or no) at each location. Note: A null value ("N") should be recorded and entered into the database when the surveyor is unable to take a measurement due to an anomaly such as sealant or patch material. A portion, greater than 0.1 m2, or all of the original concrete slab that has been removed and replaced, or additional material applied to the pavement after original construction. Patch has low severity distress of any type; and no measurable faulting or settlement; pumping is not evident. Patch has moderate severity distress of any type; or faulting or settlement up to 6 mm; pumping is not evident. Patch has a high severity distress of any type; or faulting or settlement ³ 6 mm;pumping may be evident. Record number of patches and square meters of affected surface area at each severity level, recorded separately by material type—rigid versus flexible. For slab replacement, rate each slab as a separate patch and continue to rate joints. Note: All patches meeting size criteria are rated.